There have been critical debates on potential solutions for reducing CO2 and greenhouse gas (GHG) emissions in all sectors. As part of the Paris Agreement, adopted by consensus on 12 December 2015, long-term goals have been set by several countries around the globe to limit the increase in global average temperature in an effort to mitigate the effects of climate change. In the shipping industry, most recently, the target of a 50% reduction of the Greenhouse Gas from shipping emissions by 2050, compared with those in 2008, was a milestone decision adopted within 2018 by IMO and at the same time, an ambitious plan which highlighted that much change is needed toward that end. However, how can associations and individual companies or even nations take the lead by themselves in shipping? It is well known that the industry is making a start towards the far-reaching change, but it is a very slow one and it is now time, emissions regulations to become the game-changer for the shipping industry. What has become clear is that the serious issue of climate change will continue to push shipping industry stakeholders to figure out solutions and ensure that a balance between ship safety and environmental protection is always maintained. Twelve months from now, the Sulphur cap, for which everyone in the industry is highly concerned at the moment, is going to take effect, aiming to reduce SOx emissions. With regards to CO2 emissions, IMO is going to implement its strategy while already many organizations are revealing their ambitious plans toward full decarbonization by 2050. Most recently, during COP24, Maersk announced its own climate target for net-zero emissions by 2050.’’We need a mindset change and gearshift, moving our focus from short-term energy efficiency to long-term solutions’’ stated Mr John Kornerup Bang, Maersk’s Head of Sustainability Strategy. “At some point in time big and small shipping companies need to change to new fuels will much lower impact on climate and environment. Some big shipping companies already have serious plans in this direction for example Stena and Wallenius. There is a need for stricter regulation on international and national level as well as financial incentives to increase the pace in the change.”, added Selma Brynolf, Doctor of Maritime Environmental Sciences at Chalmers University. Interestingly, CO2 emissions from ships declined from 916 million tonnes in 2008 to 812 million tonnes in 2015. 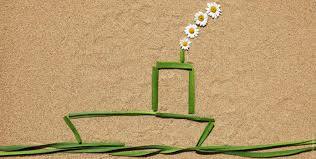 Furthermore, a report issued by the Global Maritime Forum finds “non-fossil fuels’ and ‘alternative propulsion technologies’, both potential pathways towards the goal of reducing GHG emissions, to be less significant in impact and likelihood over the next 10 years. The same report finds air pollution in the top five issues that the maritime industry is relatively unprepared to deal with. According to Christine Loh of the Hong Kong University of Science and Technology and former Under Secretary for the Environment in Hong Kong, when it comes to preparedness, maritime professionals seem unsure whether their company has made the right emissions reductions decisions. A carbon pricing initiative could help develop emissions reduction technologies and subsequently incentivize companies to reduce their GHG emissions. “We need more openness,” notes Aron Sørensen, BIMCO highlighting that shipowners need to go public and talk about how much they have contributed to reducing greenhouse gases. Although much has been achieved so far, industry stakeholders need to make the results more visible.